You don’t have to do something unless you choose to do it. These are the things I don’t do automatically anymore. I think first, and decide if it is convenient for me. Now let me explain what I mean by ‘automatically.’ If like me, you have found yourself talking on the phone, when you were in the middle of something else, you answered automatically. Well here’s a revelation for you. You don’t have to answer if you don’t want to. But what if it is important, what if somebody needs me? They will find you. Think back to how many unwanted phone calls you’ve taken when you are in the middle of something, or just plain tired, reading a book or watching a movie. I’m guessing the vast majority of those calls were not life and death calls. It was your mum, your mother in law, your friend wanting to gossip. Sounds simple, doesn’t it, when you start to realise you don’t have to answer unless you are actually free to do so, but so many people still pick up the phone when they don’t want to. It’s a hard habit to break, as for many people, there are underlying ‘guilts’, ’emotions’ and ‘untruths’ that make it difficult. Technology doesn’t come with the type of ‘how-to’ manual that you actually need, like only pick up a call if it is convenient for you. 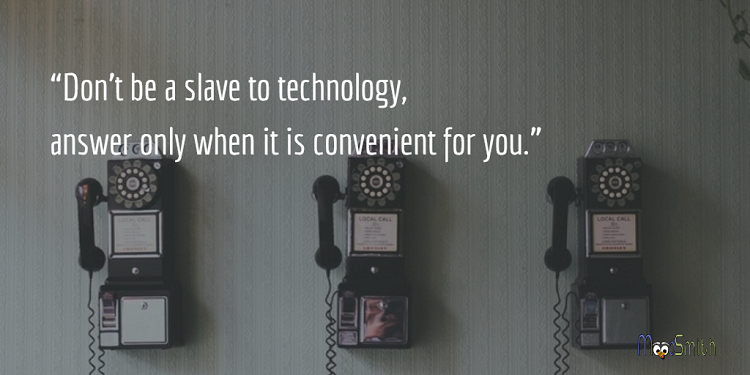 You might have become a slave to technology and other people’s wants. If I call you, it’s because I want to talk to you about something. If you pick up, and start to chat, I assume you are free and keep talking. Now here is where it gets tricky. We are always available and there are some underlying assumptions that go along with that statement that just don’t fit how we are as human beings. Many people assume that you should be available to pick up, or at the very least, return their call a nanosecond later. Some people (you know who you are :)) send messages to make sure you received the voicemail 90 seconds ago! There is an underlying pressure to instantly return calls, emails, and pick up every phone call, but it doesn’t say that in the how-to manual, or my how-to manual, anyway. You will be doing this all automatically and then confused as to why you feel overwhelmed. In the not so distant past when phones and tablets did not beep and ring every time (friends, family or spammers) wanted to connect with you, you had more choice. At worst, you got an unwanted call from someone selling double glazing to a phone that was attached to a wall – and not attached to your hip! Now that unwanted call follows you around everywhere you go. For me anyway, it is important to disconnect. I am not always available and here is why. When I am sitting in the garden, that’s my down time. When I am at work, that’s when I work and take those alerts seriously, but I only work when I am at work, and I suggest you try to do the same. I am not always available, how about you?